The subjects of “Spining and FLO” go hand in hand together when dealing with perfecting shafts for your clubs. The subject of FLO (Flat Line Oscillation) refers to how the golf shaft and is supposed to oscillate when loaded in your back swing through ball impact. All clubs experience some amount of oscillation during the swing. 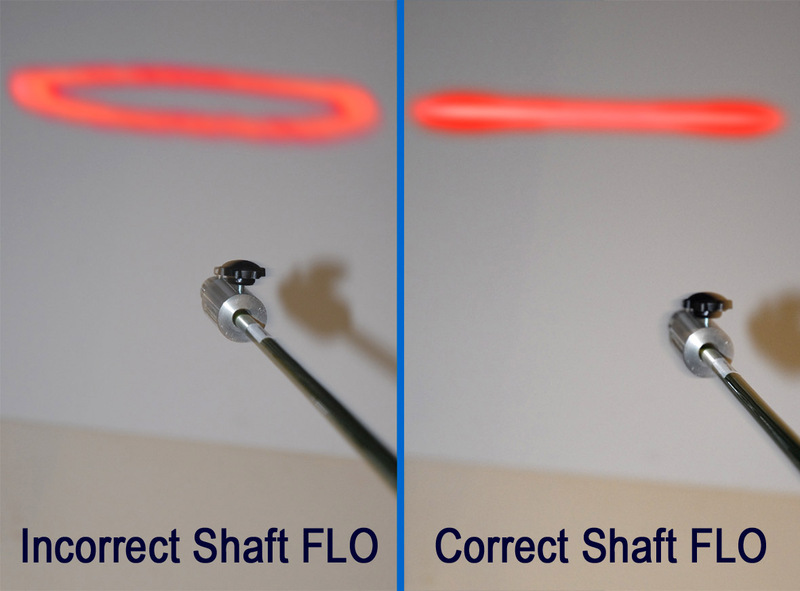 The goal of Flo Plane Orientation is to align the shaft and club head in a straight line (plane). This results in a horizontal back & forth oscillation. When correctly placed in the direction of the ball at impact, more distance and accuracy is achieved. A non-flat line consists of oscillation in a circle or an oval pattern. Which means the club face is on a wobble coming into impact. Therefore, the golfer’s shots tend to spray, due to uneven contact with the club face and ball. Although produced by computer-aided precision tools and machines, golf shafts are not perfect. They are considered to be asymmetrical – not symmetrical. Symmetrical balance is when everything is perfectly and evenly balanced out. Asymmetrical balance refers to a design that has dissimilar elements but still appears balanced. Furthermore, club shafts are never perfectly round! There is always a small flat area on the cylinder (tubular) shape. This creates stable (strong) and unstable (weak) planes. Theoretically, you divide up the 360 degree circumference of the shaft into quarters on two planes of access. Imagine a circle evenly divided into four sections similar to a target sight. Put simply, a shaft is a spring, which is affected by restoring force when load is applied to it. This is proportional to the amount of deflection and the stiffness of the shaft. Because the cross-section of the shaft is not perfectly symmetrical, then it will have a weak plane and strong plane. The purpose of FLO is to identify the most stable plane (as per SST PURE or the process of Puring). So, Flo Plane Orientation identifies the weak and strong oscillation planes on the shaft. The stable plane will provide FLO for the shaft during swing motion. A spine finder is used to find the natural bend point (NBP) of a shaft, and then used as a reference point to find FLO. The NBP is the weak plane and the strong plane (not necessarily the spine) is 90 degrees opposed. The stable plane should be installed to face the target. When the FLO is oriented to (pointed toward) the target, this results in two things. First, a more consistent center of face strike. Second, a repeatable ball flight pattern. Hence, it is possible to orient a golf shaft into the club head at a specific position to maximize its capability and performance. Studies have shown that factory installed shafts can have a full flex variance between certain clubs. It all depends where and how strong the spine is located. This is presuming that halfway decent shafts were used in the first place to build your set. Of greater importance is the need to profile and sort shafts prior to installation. To have a set properly built, you may benefit from Spining and FLO. The top grade high priced shafts are often pretty consistent and may already be shaft aligned at the factory. However, the lower budget graphite and steel shafts are rarely aligned properly into a factory club. Shaft orientation and alignment does not happen at the factory because it costs more in time and labor. Proper club assembly is so important and does not happen at the OEM factory level. It does get done in the shops of Professional Clubmakers like Better Golf Shot. We know the added value that this process can provide. At Better Golf Shot, we have the tools for spine identification, testing, and precision aligning by single degree increments. Our equipment can Spine & FLO both disassembled and already assembled golf shafts. A basic test can even be performed on finished clubs. The test can identify whether or not your club head oscillates in a circular oval or straight linear plane towards the target. Obviously, a non-linear pattern indicates erratic behavior by the club when loading it and striking the ball. If you think that the major manufacturers FLO their shafts during mass production – think again. FLO orientation takes time and effort – which equates to higher cost. Supposedly, the graphics on a shaft, which face the golfer at address, place the strongest most stable plane towards the ball. This is simple not true in the majority of cases. In about 60-65% of shafts tested, proper FLO orientation was not correct with the graphics on the upside of the club shaft face.